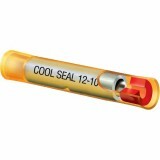 Cool Seal is the most innovative and cost effective sealed electrical connector to hit the market in 25 years. This heat-less, solderless terminal utilizes revolutionary anaerobic sealant technology that installs in a fraction of the time of comparable heat seal connectors. Simply strip the wire and crimp, activating the sealant, to create an environmentally sealed connection.